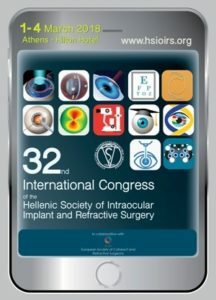 Presenter: Evangelia Stangogianni MD; Crisanti Stangogianni MD Toric Intraocular lens implantation for corneal ectasia: case report. 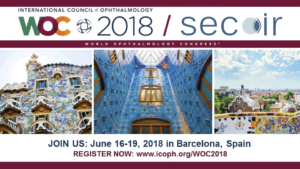 Effect of topical nepafenac ophthalmic suspension 0,3% as an non steroidal anti-inflammatory in prevention of cystoid macular edema after cataract surgery. Nepafenac 0,1% an ophthalmic non-steroidal anti-inflamatory drug for the prevention of cystoid macular edema after phacoemulsification. Analysis of surgically induced astigmatism and axis deviation in micro coaxial phacoemulsification. Clinicopathologic study of dry eye, trehalose 3% and hyaluronic acid 0,15%. Orbital exenteration of a choroidal melanoma. Quality of Vision after Bilateral Multifocal Intraocular lens implantation. Dry eye & histopatologic conjunctival study after therapies (3%) and hyaluronic acid (0.15%) treatment. Endoscopic Ophthalmic Biopsy in Ocular Tumors: Case Report. Friday, April 17, 2015 KIOSKS (San Diego Convention Center) Evangelia Stangogiannis-Druya, MD Crisanti Stangogiannis-Druya, MD. ASCRS-ASOA Symposium & Congress. San Diego,California, USA Abril 17-21, 2015. Dry Eye and Autologous Serum: Histopatologic Study. ASCRS Paper Session 3-G CORNEA Dry Eye and Biomechanics Monday, April 20, 2015: 1:26 PM Room 1B (San Diego Convention Center) Crisanti Stangogiannis-Druya, MD Evangelia Stangogiannis-Druya, MD. ASCRS-ASOA Symposium & Congress. San Diego,California, USA Abril 17-21, 2015.